In one small area of the South China Sea, Hong Kong is the most famous island of the Wanshan Archipelago but far from the only one. There are two hundred and sixty-plus outlying islands and some of these are accessible from Hong Kong by ferry. The downhill took us past many burial places in bamboo forests and brought us back to Sok Kwu Wan where we had a meal at one of the many fish restaurants on the waterfront. The whole trek took us about 2 hours and 15 minutes. Another ferry ride from Hong Kong took us to the dumbbell-shaped island of Cheung Chau. About an hour away from Hong Kong, it’s a fishermen's island and former pirate haven with no high rises, no cars, but lots of bikes. The village harbor area on the west side has many alleyways with small shops and fish restaurants and the east side has a nice sand beach, Tung Wan, with shark nets for protection. We took another swim in the sea and found a bunch of beach glass on the shore. (Lee Lai Shan, a windsurfer from Cheung Chau, won Hong Kong's first and last Olympic gold medal in 1996, the last year before Hong Kong began competing as part of China.) After leaving the beach, we visited the Pak Tai Temple. Pak Tai is the island's patron deity and was credited with saving islanders from the plague in the 19th century. Not all of the islands require a ferry ride. Lantau Island is connected by train to Hong Kong Island. This is mainly because Lantau is home to both Hong Kong International Airport and Hong Kong Disney. It’s not all commercial though. One day we took the train to Tung Chung on Lantau where we got on a cable car to take us to Ngong Ping, site of the112 ft. high, bronze Tian Tan Buddha as well as the Buddhist Po Lin monastery. The 4-mile, 25-minute cable car ride is breathtaking as it crosses over a bay and then over 3 steep peaks before landing in Ngong Ping village. A walk through the village brings you to the 250 steps leading up to the Tian Tan Buddha. At the top, the view is expansive and the terrace is decorated with large statues of Buddhist saints (Bodhisattvas). All of these excursions were counterpoints to the urban experience of Hong Kong Island’s north shore, which is fascinating in its own way. It has morphed from the place of miniature skyscrapers and a sprinkling of white bungalows and luxury flats near the peak as depicted in Richard Mason’s book, The World of Suzie Wong, into a cosmopolitan behemoth. It now has more buildings over fourteen floors than any other city in the world and puts on a daily light and sound show over Victoria Harbor that is dazzling. However, you can still find your Zen on Hong Kong Island. Forty percent of the territory is country and nature reserve and the south side is home to wooded areas and beautiful beaches. The south can be reached by taking a train from Hong Kong’s Central Station to Shau Kei Wan and transferring to a bus. The bus ride is over narrow, winding, mountainous, coastal roads with spectacular views. Shek O (rocky bay), on a peninsula in the southeast, is a pretty village with some beautiful villas, no high rises, and an excellent sandy beach for swimming. 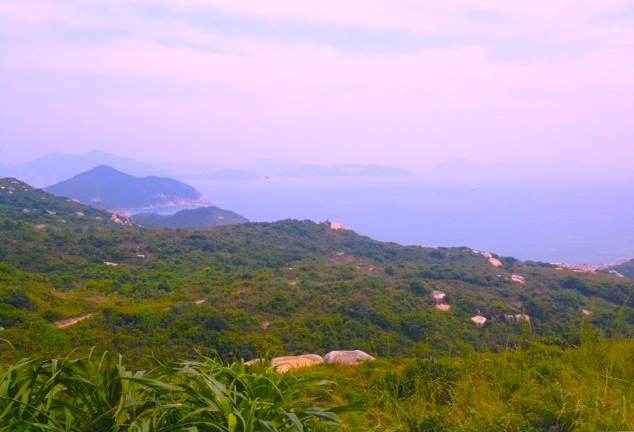 West from Shek O along the south shore is the town of Stanley. It was named for Lord Stanley, British Colonial Secretary in 1842 when Hong Kong was ceded to the United Kingdom. There’s no direct bus from Shek O to Stanley but taxis are both available and reasonable. Stanley has a decided Mediterranean feel with a lovely harbor, waterfront restaurants, and nice beaches. It also has a thriving market. Interesting features of some architecture along this road are the giant holes you see in high rise buildings. These “dragon gates” are deliberate and part of a belief system called feng shui. They allow the dragons that tradition says lie under the hills, to fly from the mountains to the water. Blocking the dragon's path is thought to bring misfortune. Is there an island somewhere that has inspired a story for you?